Advance directives are frequently unavailable when they’re needed for a variety of reasons. That can add additional stress to an already trying time. Our firm wants to make sure that doesn’t happen to you, which is why when you complete your estate plan, we’ll provide you with a risk-free one-year membership in DocuBank. 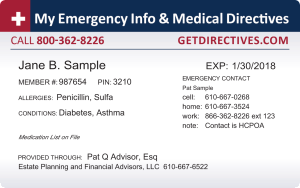 Th e DocuBank Emergency Card makes your advance directives immediately accessible 24/7. Hospital staff can obtain your documents via fax, or print them from the DocuBank website. Along with your directives, the hospital will also receive the names and phone numbers of your emergency contacts and physician. The card also lists allergies and medical conditions to help doctors provide you with the best treatment. We offer a one-year DocuBank membership with every estate plan so that our clients can have the peace of mind that their documents will be available when they need them. 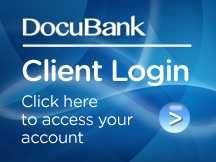 Already an existing DocuBank member? 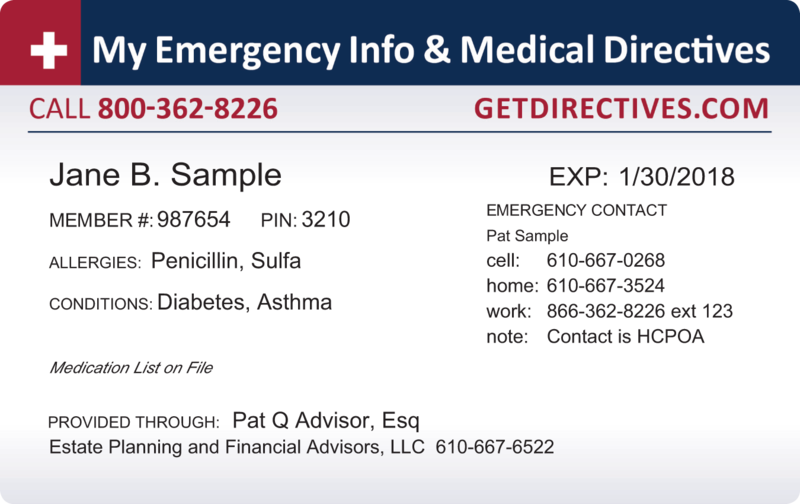 Update your emergency contacts, view your advance directives, or access your SAFE by clicking here to log in to your DocuBank membership online.